Middle East and Arab lands may be changing in terms of technology and development. But when it comes to the fashion statement, the story is full of ancient traditions and deep cultural trends. Arabs are proud people, and they take due pride in maintaining their historical dress code. The hot and arid climate forces the people of Middle East to cover their heads. These reasons for using head gear are further supplemented with religious obligations. Arabs have distinct headgear for men and women. The Arab males have good variety of head gear to choose from. Their traditional head wear options contain Kalansuwa, Turbans, Imamah and Keffiyeh. While, the Arab women stick to the Hijab and Niqab as part of their headgear. Agal and Keffiyeh – Male Arab Headwear: Majority of the Arab males wear Keffiyeh also called as Shemaghs. It is basically a traditional square cotton scarf which they put on their heads and then grip it with strong hosepipe like stuff called Agal or Aghals. Each tribe, Area or even country has their own traditional colors for Keffiyeh. In UAE, the most prevalent color for Keffiyeh is white with the black Aghals. That scheme varies for Saudi Arabia, Palestine, Bahrain etc. The simplicity of Keffiyeh has made it an international trend even in the cities like Tokyo and Paris. It has become a popular global headgear. While Keffiyeh are the headwear of the majority of the population, yet people opt for other options also. Among other popular choices are the traditional spherical caps called Qalansuwa, cotton Turbans and Amamahs. 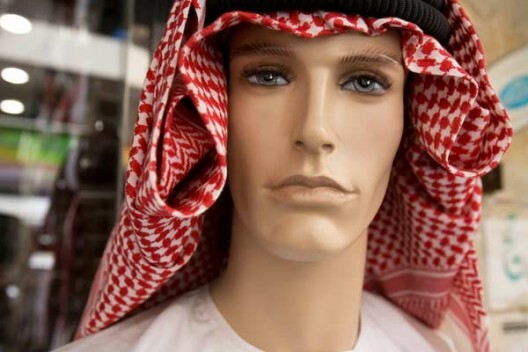 All these varieties of men headwear are easily available in the local Arab markets in different prices depending on the material and stuff used. Female Arab Headwear: Like men, the Arab women also use head-wear as part of religious and cultural practice. The most of the Arab females use Hijab, a head scarf to cover their heads. The Hijabs come in different colors and sizes. Most of the time Hijabs are accompanied by an Abbayya , a long robe which women use when they go out in public. The females also complement Hijabs by Niqab, a facial veil. Today, Hijabs are popular headgear around the globe. The Hijabs and their accessories are easily available in the local markets. The changing Arab headwear trends: The new headgear trends are also making inroads into the Arab fashion. The Arab males are also adapting western headwear. They can be seen wearing hats in the parties. Moreover, when they are traveling in other countries they give up their traditional Keffiyeh to don designer caps. The female head-wear style is also changing gradually. The influx from subcontinent has brought new headwear options for Arab women. Dupatta, a large shawl has emerged as a popular substitute of Hijab. Many Arab women are also opting for designer made Duppattas which come in huge amount of fashion varieties. The lush Arabian head-gears are not only comfortable but they are also quite trendy.Besides, their usefulness in the arid climate cannot be denied. This is the reason why these headgears have been envied, copied and worn by the people of the world.